And so, what else is new? My previous post touched on the Occupy Wall Street phenomenon, the people’s revolt against the wealthy and corporate interests, who don’t pay their fair share in taxes, yet harvest bundles in a listing economy even as millions suffer and others wait for the shoe to drop. Currently, corporate cash holdings are at an all time high. Did you know, for example, that corporations comprising Standard & Poor’s 500 index have currently stacked up more than $1 trillion in cash and short-term investments? Now mind you, the figures I gave you don’t even take-in the banks, whom I’ll get to in just a bit. While our economy hasn’t recovered and there’s the very real possibility of a double-dip recession in your near future, corporations and banks are raking in the bucks. Wall Street jubilantly anticipates per share earnings for stocks in the S&P 500 will reach $100 per share by year’s end; in 2012, slower growth, but $104 per share. True, if the economy dips again–did it ever recover?–we could see these projections tumble. Still, don’t bet against the banks and corps. Like a nimble cat, they tend to land on their feet, come wind or rain. And so what are the corporations doing with their wealth? Well, they’re doing what you and I would probably do were we in their shoes; namely, shoring up for future contingencies. One thing they’re not doing is hiring workers, given market insecurity. They’re also not desisting from awarding themselves egregious bonuses. Hey, we spent nearly a trillion bailing these guys out. Thanks for the memory! As for the banks, they’ve proven themselves adept at getting around recent congressional moves to protect consumers by imposing caps on credit cards, overdrafts, and debit card merchant fees. That helps explain the sudden deluge you’re getting in bank mail, announcing new terms for checking accounts, reduced credit card awards, and higher ATM fees. Some banks, like Bank of America, are imposing a monthly charge for deposits or withdrawal using a teller ($8.95 at BOA). Banks like Chase now charge $25 for closing an account within 90 days of opening it. It gets worse at PNC and U. S. Bank, which charge $25 for closing an account within 180 days of opening it. Want to get your statements in the mail? Think again. BOA again charges $8.95 monthly for the privilege, with other banks now lining up. You prefer pay-as-you-go, using your debit card. Nice way of keeping your budget tidy and avoiding credit card charges, except that some banks are now charging a $3 fee for the privilege. The gimmick that galls me above all others, since I was on the recipient list, was learning I’d be charged a monthly fee even if I had a 0 credit card balance. You can be sure I got out of Dodge. You’d like to buy a home at today’s record interest lows? Fine, if you’ve got the minimal 20% down payment. That eliminates a good many first timers, especially young people. Want to refinance? Not so fast. What’s your home really worth versus the mortgage presently owed? The banks are going to want to take a close look. And don’t forget the closing costs. When banks and corporations bleed you and me and refuse to loan or invest in the body politic, they divest in stimulating recovery and should be held accountable. Watch your step. Corporate and bank IEDs are everywhere. 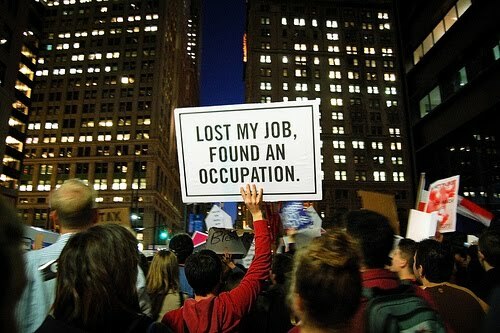 Hats off to the Occupy movement. I adore you!